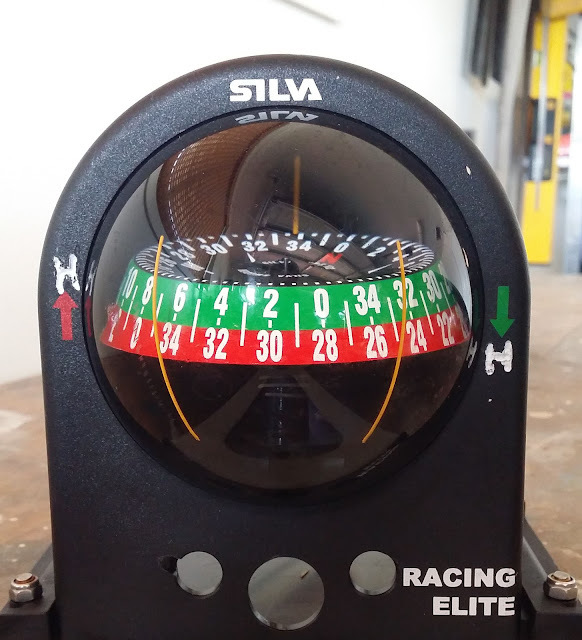 I put a Silva compass on the boat some years ago and have been questioning whether it made my sailing worse or better. I have pondered discarding it. Either way, I realised that I was often reading it incorrectly partly because I sail in lumpy water and it is easy to miss a shift (hence the compass) and because I could not see the arrow head of the green and red markers at either side of the card. I engraved a H (for header) at the point of each arrow with a soldering iron and then filled in the groove with white paint. Easy to see. Perhaps some of the lesser sighted could benefit. More on compasses can be read here.